Our team of professionals are ready to get your vehicle back on the road. Our roadside service includes, tire changes, lockouts, jump starts and off road vehicle recovery. We proudly provide 24 hour immediate response services. 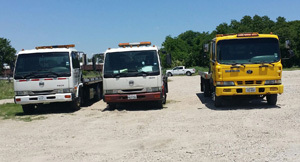 We provide towing services both long distance and locally. We will tow your vehicle to a shop of your choice.